Simply put, there's no higher-quality, 3 PC. stainless steel fine mesh strainer set. See for yourself why our rugged 3 PC. design with a mirror finished rims is chosen by chefs, internationally, for their own homes and commercial kitchens. See The Benefits of This Top Quality, 15 lb Capacity, 3 Pc. Stainless Steel Fine Mesh Strainer Set! - Top quality fine mesh makes this strainer set as ideal for skimming light stock & fruit pulp as it is for draining super heavy loads of pasta and other weighty food materials. - Strong 15 lb stainless steel construction combined with an attractive stylish look makes these fine mesh strainer perfect for both professional kitchen performance and optimal kitchen appearance. 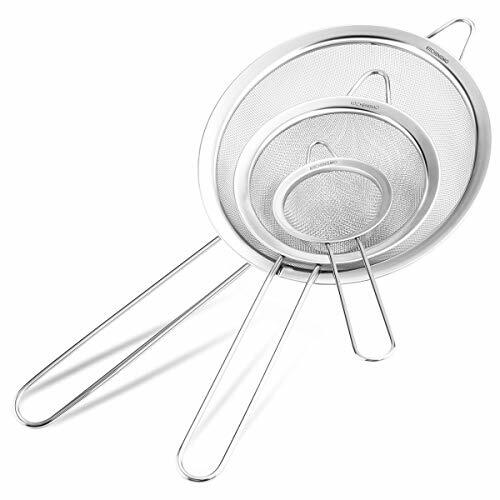 - Convenient hanging holes on each of the fine mesh strainers make for quick and easy storage/access, on home and commercial kitchen storage racks. - Long handle on this worry-free strainer leaves you assured that this strainer is as safe in a dishwasher as they are over a burning stove. - Enjoy hands-free straining using the broad, mirrored brims that comfortably sit on top of pots and other similar broth and fluid catching objects. GET YOUR PREMIUM QUALITY 3 PC. STAINLESS STEEL FINE MESH STRAINER SET TODAY! DURABLE 3 PC. FINE MESH STAINLESS STEEL STRAINERS (3.35", 5.5" & 7.88") - Premium quality stainless steel strainers with non-heat warping, long wire handles, and beautiful, mirrored, broad rim design. EASY STACK & STORE OR HANG - You can stack and store these fine mesh strainers, or hang them in the kitchen for that perfect, professional kitchen appearance. COMMERCIAL GRADE STAINLESS STEEL STRAINER - This Strainer is dishwasher safe and will never rust. FREE 5 E-BOOK BUNDLE - Make delicious treats with your new fine mesh strainer! 100% SATISFACTION LIFETIME GUARANTEE! - Kitchenismo Strainer come with a satisfaction lifetime guarantee, and if they don't work out for you for any reason then contact us for your full money back. We know you will love them! To enjoy your premium strainer, click 'Add to Cart' now! If you have any questions about this product by Kitchenismo, contact us by completing and submitting the form below. If you are looking for a specif part number, please include it with your message.